Minimum dia. of rolling : 65mm. Maximum width of rolling: 700mm. High speed fully automatic yarn winding machine. - Supplied with 2 Nos. of Black / White board. Suitable to wind balls from 5 grams to 500 grams. 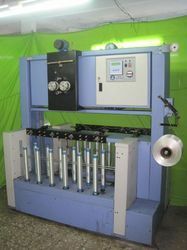 We manufacture and offer an extensive range of Automatic Ball Winding Machine. These machines are applauded for their high efficiency, robust construction and easy installation. 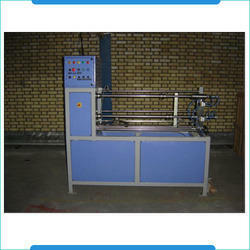 Manufactured using high-quality material, these machines are widely used in various industries. We are manufacturer of Yarn Winding Machine. We are the leading manufacturer and supplier of Y cone winder is used for nylon, pp yarn and mono filament yarn winding in sewing thread field. Our company has been able to serve our valued clients with an extensive range of Sutli Winder. 6 Spindle, 9 Spindle & 12 Spindle in one Segment Travers 2.5", 4", 6"& 8". Line Speed 90 to 150 MTR./Minute. 50 mm ID Heavy Duty Torge Motor. We are the leading manufacture supplier exporter of Yarn winder and offer this product as per client requirment and i am looking for foreign query . We are recommended amongst the clients, for offering a quality assured assortment of Winding Shaft Assembly. The Winding Shaft Assembly we offer is widely demanded amongst the clients for its safe use. These products are suitable to meet the applications of various industries. Backed by a rich industrial experience, we have come up with a world class assortment of Yarn Appearance Board Winder. A winding machine or winder is a machine for wrapping string, twine, cord, thread, yarn, rope, wire, ribbon, tape, etc. onto a spool, bobbin, ree.